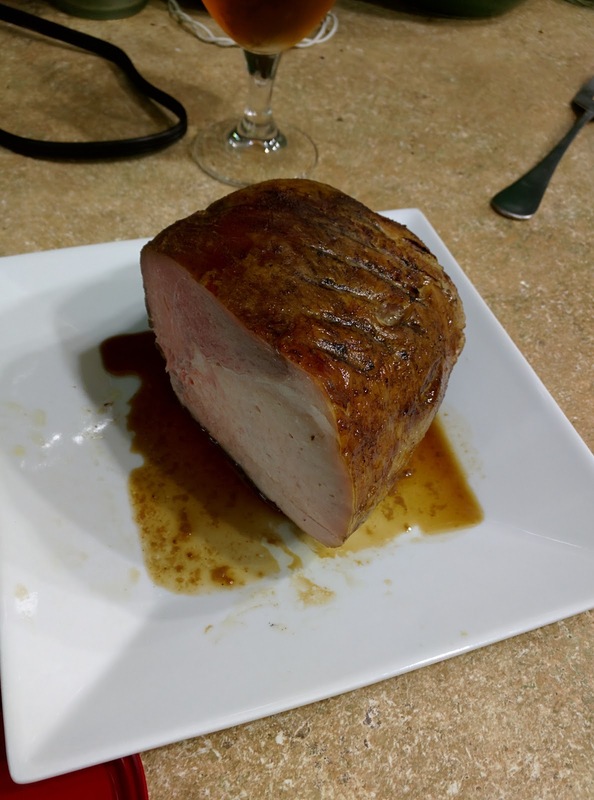 So for the 5th of July, I made a slow cooked, smoked pork loin. Frankly, it was awesome. The flavor, the texture, the smokiness, it was just spot on. Below is the approximate recipe; I didn't really...measure...anything, but it's pretty close. Again, none of those amounts are precise, so just tweak it to taste. Prep the pork loin by spearing it in a few places with a knife. Then put all of the ingredients together in a ziplock freezer bag and let it sit in the fridge overnight. The next day, you could probably throw it on a smoker and cook it nice and slow. I'm sure it would turn out great. 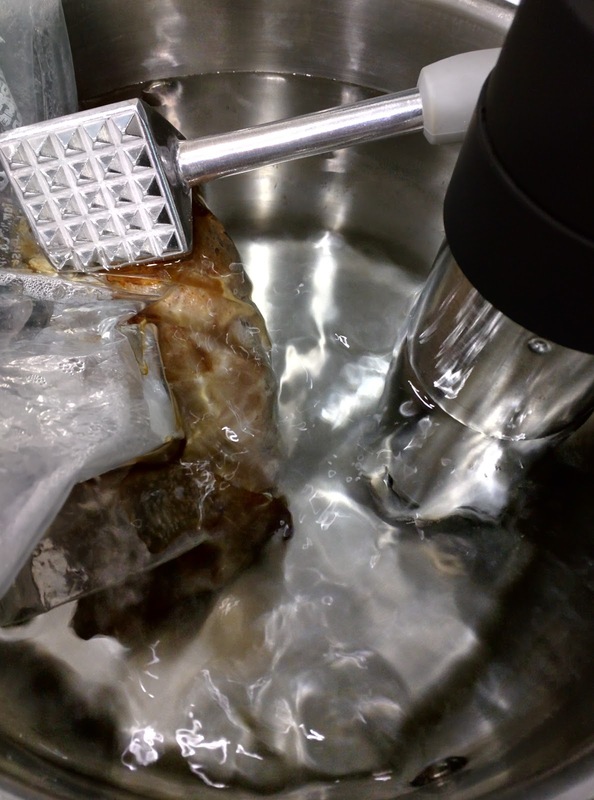 But what I think made this one turn out so good was cooking it most of the way with my ANOVA sous vide cooker. I dialed it in to 140F and cooked the bag of pork loin and seasonings for about 4.5 hours. It gets a little buoyant as it cooks...had to weight it down. As it was finishing in the pot, I got my grill going. It's a homemade contraption, made by an old colleague, but it works great. It acts like its somewhere between a charcoal grill and a smoker. Cooks faster than a traditional smoker, gives a better smoky flavor than a traditional charcoal grill. In addition to the charcoal, I threw a tinfoil pouch of cherrywood chips on it too. As it started smoking, I took the pork loin out of the water bath and put the meat on the smoker. The bag had the remaining liquid from the pork and seasoning. I certainly couldn't throw that out. After a bit the smoker sealed the meat with a nice crust. Very little juice dripped out of it. 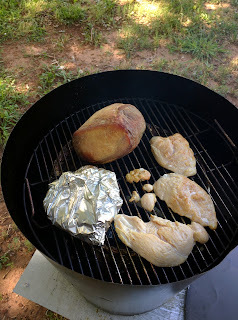 I put a few chicken breasts on as well for later in the week, and a tilapia fillet (which I basically smoked into jerky). About 45 minutes later, I took the pork off and let it rest for a bit. Then I cut in and had a bite. Oh, it was god damned delightful. Juicy, smoky, a little spice from the chipotle, and a little sweet from the brown sugar. Melted in the mouth. Pouring the juice from the bag onto it made it even better. It was just awesome. Had it with corn on the cob as well, a great 4th of July meal, a day late. Beer update! The sort of British ESB type thing I made the other day is progressing nicely. Visible signs of fermentation have mostly stopped and the gravity readings show that it is about as low as it will go. Side note! My wife poured herself a beer (nothing on tap, sadly), only to realize that she grabbed one she didn't like (an IPA). Now I have to drink a beer tonight...oh damn.